Exelca´s sire is Ciemny, a son of the Exelsjor-son Grojor (out of Grobla/El Trypoli) and out of Ciotka (Essaul x Cisawica). Exelca´s dam Exessa is a daughter of Exelsjor making Exelca linebred to this legendary stallion. Exessa´s dam is the Janów Podlaski-bred Edessa (Pietuszok x Ellora) and Exessa is a fullsister to Edjora, the dam of US National Champion Mare Kajora - the dam of the great Gazal Al Shaqab. 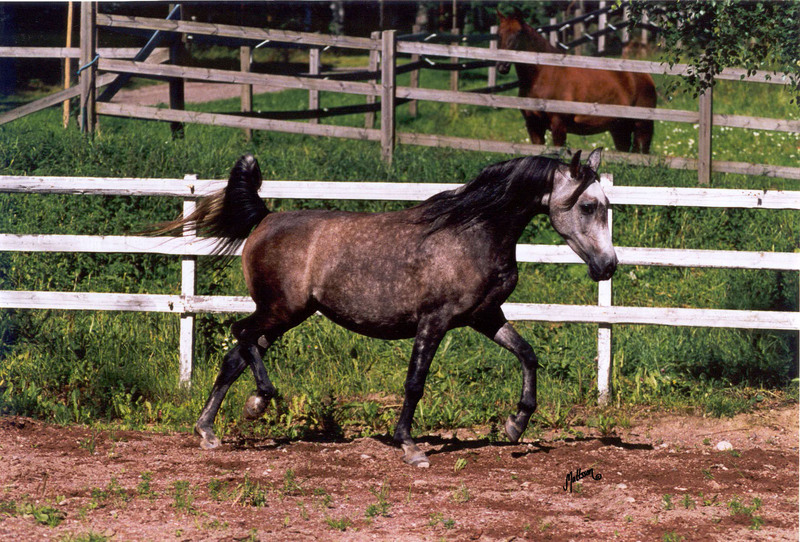 Exessa has been a valuable mare in Swedish Arab Horse Breeding and can be found in many Swedish pedigrees. Edjora was exported to USA after only leaving one foal - the daughter Wiewiorka (by Espartero), but her descendants has been very successful. Unfortunately Exelca had to be put down in 1997 due to an injury out in pasture. With her very correct conformation, impressive pedigree and great legacy I am sure that she would have been a great brood mare.